Minimalist is all very well, but indoor plants really do contribute to the health, happiness and productivity of an enterprise — and they impress all your visiting clients too. Incorporate a beautiful, natural environment and see how you reduce minor illnesses, stress levels, and noise, and also improve the air quality and atmosphere. 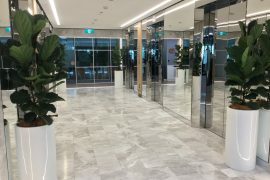 However well designed, an office space can look monotonous, so breaking it up with glossy green leaves and enhancing its aesthetics have a positive impact. There’s a good vibe about when employees are healthier and happier, something that is increasingly understood by companies which are devoting more space and money to integrating green plants into buildings, as well as designing and planting rooftop gardens and even keeping bees. Some city restaurants are growing their own herbs now. Clients love the look, and the common sense and taste behind the whole concept, and that gives them more to talk about so that a different, closer and more friendly rapport and relationship can be established and built on. You can reduce Sick Building Syndrome — and staff sick days — and please your staff and customers alike. Who doesn’t prefer a brighter, lighter, more sustainable environment? The investment in plants is well worthwhile, but you can’t do it all in-house, however much your staff enjoy looking after plants. That is not why they are there. The plants need to be properly chosen, watered, fed, pruned, cleaned and dusted, so it is advisable to commission and then rely on professional expertise — and that can be provided by Bretts Plants. We can combine individual needs and wishes with interior landscaping and will fulfil your every requirement with thriving plants that reflect your outlook and interests. Our rental service makes sure that the plants in your office always look hale and hearty, and a family-owned business like Bretts takes their clients very seriously. When Bretts Plants look after your needs, visiting customers are seriously impressed -— and often go home with their telephone number and email address.